Here are the customers reviews for Grandes Marches Brasserie in Paris - Do not hesitate to give your opinion for this Paris restaurant. This restaurant is a brasserie - located 6, place de la Bastille 75012 - Facing the famous Golden Angel, just next to the steps of the modern Opera of Paris Bastille. Exciting decor, pleasant staff and innovative, modern cuisine. All this at prices wghich didn't make the eyes water. In the lobby a well-stocked counter of fresh seafood and fish augured well for a gastronomic evening. We were not disappointed. The sauces were superb as was everything else. Only one thing ... who is that on the plinth in the square? Gorgeous, golden statue ... but none of the staff had any idea about it, mirroring our own ignorance! Not a typical Paris Brasserie like Bofinger just meters aways but a trendy place with a modern decoration - Lunch menu is nice and not expensive as it could be expected for a restaurant enjoying such a location. For Pauline : The monument standing on the square is the Colonne de Juillet, a column commemorating another revolution than the famous one (in 1789) that took place in 1830 during which king Charles X was replaced by king Louis-Philippe. The 52 meter high column honors the 504 victims during the 3 days of the revolution. The column is topped by the 'Spirit of Liberty' statue. Why don't we let anyone get an immediate publication of its review ? Well because we experienced many spammy ones and we would like to filter it to maintain this website clean. 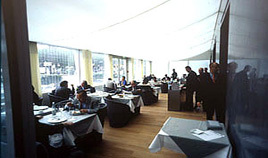 The Paris Restaurants Guide is an excellent ressource to find and book online Restaurants in Paris. Currently featuring several hundred restaurants in Paris, including all the top restaurants but also the famous Paris Brasseries and Bistros, it is the definitive online guide featuring online reviews and booking facilities.